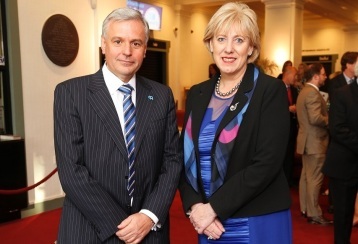 The Minister for Arts, Heritage and the Gaeltacht, Heather Humphreys TD, has announced that her Department is providing €25,000 in support for Business to Arts to leverage private sector support for New Stream, our training and development programme which supports arts organisations in building fundraising and organisational capacity. Minister Humphreys said “I am very impressed with the work of Business to Arts and the way in which it helps business and arts organisations to form mutually beneficial relationships. As we emerge from several difficult years of cutbacks for arts organisations, it remains important to find new and innovative ways to access support from the private sector. “The New Stream programme focuses on training and development to allow the cultural sector to build fundraising and organisational capacity. This gives arts organisations the tools they need to engage with the private sector. I am very pleased to have been able to protect our National Cultural Institutions and the Arts Council from any cutbacks in this year’s Budget, but I fully recognise that the sector is still facing challenges. By helping arts organisations to diversify their funding options, Business to Arts is playing a really important role in future-proofing the sector.